I have been a teacher of English for 24 years, a Headteacher for 9 years and, at the age of 48, this much I know about performance-related pay for teachers. Who brought politics into education? Last December I was asked by a BBC reporter whether I regretted bringing politics into education and my reply was, quite simply, that it was the politicians who brought politics into education, not me. Since then I have tried very hard to be a-political in these pages but I fear what follows might break my resolve. …I didn’t go into education to make money and I don’t know any teacher who did. My profit is great examination results for our students. That’s what I’m required to provide and that is what motivates me, something the Coalition clearly does not understand. Any new policy has to be cheap, if not cost-free; the new Teachers’ Pay Policy will allow schools to employ teachers more cheaply and supress pay progression. There has to be the political will to adopt the new policy; the public will be happy with the simple headline notion that only good teachers should receive pay increments. Any new policy has to be easy to implement; what could be easier than to let Headteachers and Governing Bodies make all the difficult decisions inherent in the implementation of the new Teachers’ Pay Policy? 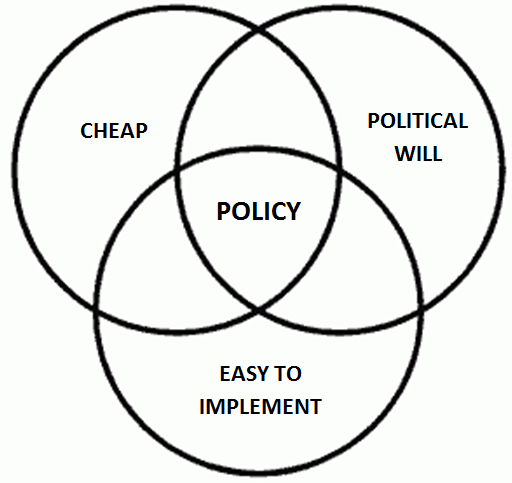 All three criteria met = POLICY! Pay rises for all from an ever-decreasing pot is unsustainable and this policy allows Headteachers to find a way to survive during austerity by making relatively arbitrary decisions about pay progression so that schools remain solvent. This year I am expected to provide a better education for the same number of children as we had in our school in 2010 with £450,000 less funding – and so far we’ve been “ring-fenced”? It is possible to pare my job down to one thing: to ensure that £6.5m a year is spent in a way which provides the best education possible for the students who attract the money in the first place. Consequently I cannot afford to reward poor teaching and never have done. Highly effective Performance Management mechanisms negate the need for performance-related pay. If a teacher really isn’t performing well and all support mechanisms have been exhausted, they should be facing competency procedures in a fair and transparent way. Everyone else should be developing their practice and be at least good. Our raw materials are not wood and steel. I was working with Dr Jonathan Sharples from the Institute of Effective Education and @HuntingEnglish yesterday shaping a research project into an element of pedagogy. What became clear from Jonathan is that it is almost impossible to isolate a single variable and eliminate all the other variables when conducting research in schools. Singling out teacher effectiveness as the variable solely responsible for student outcomes is a hugely complex business and way beyond the scope of even the best performance-related pay policy for teachers. The Sutton Trust’s Improving the impact of teachers on pupil achievement in the UK – interim findings, published in September 2011, states that overwhelming evidence [that] shows that there is almost no link between teachers’ prior education or experience and the achievement of their pupils. Steve Munby told the ASCL conference in 2012 that, if you are the longest serving Headteacher in the Hall you’re probably our best or our worst Headteacher. Like I said, judging teacher effectiveness is complex. Attempts to make judgements about pay progression completely objective verge on the impossible. I’ve heard of one model where there are four elements which combine to provide a wholly objective numeric measure for making the pay progression decision: the grade for Lesson Observation 1; the grade for Lesson Observation 2; the quality of marking and assessment gleaned from a work scrutiny; student examination data. Each element constitutes 25% of the final figure which determines the decision and if the teacher gets 70% or above s/he progresses up the pay scale. An Outstanding observation grade gains a full 25%, a Good observation grade 17.5%…yes, it’s mad isn’t it? And it’s still based on a number of relatively subjective judgements! Performance-related pay could induce competitiveness right down to teacher-to-teacher level: Why share my teaching resources with him if his students’ results improve and he will get a pay rise over me? Fullan and Hargreaves point out that, Trust and expertise work hand in hand to produce better results…social capital strategies are one of the cornerstones for transforming the profession. Behaviour is shaped by groups much more than by individuals…if you want positive change, then get the group to do the positive things that will achieve it. Who will want to teach set 4 out of 5? The more you think about performance-related pay, the more the intricacies emerge. How will re-setting mid-year affect pay progression decisions? Timetabling difficulties mean you have to take on a Year 11 group in September – are you then held responsible for that group’s outcomes? Job offers could be interesting…Headteacher: I would like to offer you the post. Candidate: Well, I have two more interviews later this week and they may well offer me M6 and you’re only offering M5 – I’ll let you know if I accept your offer on Friday evening. To use a Yorkshire term, we may see an epidemic of people giving backword…it will certainly make the whole package for new recuits to your school important: CPD opportunities; promotion opportunities; staff well-being strategies; general ethos, etc., etc..
As Fullan says, Never a tick box, always complexity. The reason the School Teachers’ Pay and Conditions Document (STPCD) is a weighty tome is because how you pay people is a complex issue. The STPCD is the accumalation of years of experience and reflection by employment law experts; leaving Headteachers and Governing Bodies to construct individual pay policies may well result in them being embroiled in appeals against their pay progression decisions throughout November and December. Headteachers have an opportunity to unite to reject the worst elements of the new Teachers’ Pay Policy proposals. The more divided we are, the more divided our staff rooms will become. We have to live by our values like never before and crush the grain of truth at the root of this old joke: What’s the collective noun for school leaders? A lack of Principals. The trouble is, Headteachers are a mixed ability group. I was at an ASCL meeting recently where a Headteacher shrieked with barely controlled joy when she realised she did not have to match new recruits’ existing pay grades, because she wanted to save a bit of money. On many levels it was a depressing moment. Let’s hope the madness doesn’t spread too far. This is a great post and I really enjoyed reading it. If you start a movement against PRP for teachers you can count me in. The complexity of a teacher’s role means simple carrot & stick approaches won’t work. Heads spending days on PRP every year is madness, there are many more issues to spend time on that will have an impact on the quality of education of our young people. I never understand why a head would want to cut the salary of their staff – who, in their right mind, would want to work for them? I’ve some scribbled notes for a blog I hope to write next week on how a school could use the new Pay Policy flexibilities to produce a different pay structure but it needs a national policy not individual school ones. Now managed to connect you with @HuntingEnglish who I hope to meet later this month. 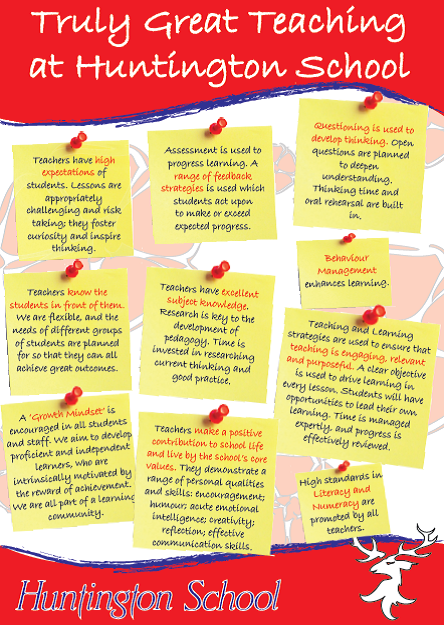 The Truly Great Teaching Poster is fantastic. Great article John. Agree with everything you say. In schools like yours and many others (& I like to think mine) this has the potential to destabilise. The hard fought & trusting equilibrium where staff are held to account, respect the process and actively/willingly engage in improving teaching is the climate which I have strived to create and wish to sustain. Gove isn’t really interested in delegating responsibility to HT’s-rather he is abdicating his responsibilities in the assumption that market forces will drive down costs. Wait until the next funding settlement when there are real cuts and budgets get tighter. I plan to keep things very open with my colleagues so that trust is maintained. For the 3rd time this school year I will be writing to Mr Gove to protest. It is reassuring that others share my views, so thank you for this John. I won’t repeat the comments of others but will add that I feel I could spend a long time designing something that only applies to a small proportion of my staff, as I have many on UPS3 or M6. My other big concern is the approach being taken by Ofsted: to expect the proportion progressing to reflect the proportion of good or better teaching is unreasonable and rather illogic, especially if applied retrospectively as this policy hasn’t come in yet. I have done some analysis for the year just gone and once new staff and leavers are discounted, and three maternity leaves, and those who have nowhere to progress to, what happened to the rest has little relation to either the outcomes of the previous year or teaching judgements in the previous inspection. A great post. To add to the ‘set swapping’ issue…. What about teachers that rarely see students? Will they be the same as those who see them several times a week? I’m supposed to see my classes once a fortnight, imagine how my Monday groups do! Pd days, Bank holidays, Holidays all mean there are some classes I see once in two months. Is it fair to judge me the same? What about people that have their ‘own’ classroom? All your own resources are to hand, you can make your room your own. displays can be all your own student’s work. Important subject posters can be prominently displayed. The think about those of us that teach in several different rooms, ‘belonging’ to teachers with varying levels of organisation. I can’t have any subject displays and student work cannot be ‘permanently’ shown in the room to motivate and stimulate. Should I be judged in the same way? I teach a compulsory subject, should I be judged in the same way as someone that has classes where students have ‘chosen’ to study that subject? I could go on! Think the point is, the could never be a set of criteria that would be able to be used fairly for all teachers. Apologies for typos. I can spell! The iPad can’t! I think I am in the minority here but I am not so against PRP as my fellow heads. I share totally the sentiments about colleaguality but Leadership Group pay has always been determined by PRP and that does seem to have been a major problem in terms of transparency and accountability. Why should we not treat all of our teachers in the same way ? I think that the threshold pay process has been for many years in school a tick box exercise with many heads not brave enough to refuse unsatisfactory staff progression on the upper pay spine. Is there not an opportunity to devise a fair and transparent system that does reward the majority who work hard and have the interests of their students at heart? Just a thought. Thanks Kevin; I agree with you in many ways, and I did have a paragraph in an early draft about how we have it in some ways already – one of my objectives is based on a headline 5 A*-C EM figure which requires all 105 teachers at our school to do their job properly if I am going to complete my appraisal successfully. I was, however, quite careful in what I wrote when I said, “Headteachers have an opportunity to unite to reject the worst elements of the new Teachers’ Pay Policy proposals.” What I was pointing out is how near impossible it will be to be “fair and transparent.” The four-part numeric proposal shows what madness is beginning to emerge out there. If we can devise a policy which is truly “f&t” then that would be great…I do think, however, with it looking like schools will lose their ring-fenced status, that there are other reasons behind the proposal. Gove claims to be bright – anyone with a few IQ points can begin to see how PRP as proposed is an imperfect model in the teaching world. Very frustrating though Kevin for those HT’s (& line managers if your system is working properly) who have made those ‘brave’ (& surely sometimes easy?) calls for the right reasons. Understand your point about SLT though. Again it’s the men in red braces in Whitehall who come with a ‘good idea’ instead of properly consulting with HT’s. I suspect that as always HT’s will make it work. Really enjoyed the post. Agreed with the previous issues of moving sets, prior student experience in early secondary experience. PRP smacks too much of a policy modeled on the belief that somehow the market will smooth out all the problems (or at least show where they are). Threshold pay was a problem – back in the day it was a portfolio of practice which was too much based on evidence of what you did but not the impact. Then it was streamlined to an almost expected belief it that pay progression came up with the rations. The pendulum has swung more to ensuring that pay progression should be warranted but, I would hope there should be some good practice documentation on what that looks like. Hello, we currently engage with a lot of heads around the country discussing the same issues affecting PRP and performance management. Many heads we meet know very little about the changes ahead, but we have been able to support them in their preparation for PRP. We have written a new interactive electronic publication that supports schools and teachers in their own performance management and helps them to evaluate their performance against the teacher standards and ofsted criteria for teaching. It goes on to provide support for development and improvement in the profession. This e:book is proving very popular and we have already sold a relatively large quantity in the last couple of months with very little marketing. We believe it is essential for all schools to have robust and accurate performance management tools and the ‘Meeting Standards: Raising Standards – Teachers’ Portfolio’ ebook is just that. License prices vary depending on the size of the school as the e:book can be shared and edited amongst all the staff in the school, but for a 1 form entry primary school, the cost is only £124.95 + VAT. Performance-Related Pay creates a competitive and distrustful environment in schools damaging pupils’ education. A stratified system undermines democracy and leads to unfairness and injustice. Very interesting article but what about Gunn Towers? I recently worked in an International School with performance pay in the form of teacher proficiency rubrics (not test scores). The good news is that multiple people did multiple evaluations and reflections with teachers. The bad news is that those not on the performance pay cycle rarely saw an administrator. The other bad thing was the comparisons teachers started making with one another. …and this was done in a school that could afford to pay all teachers top dollar if they achieved top scores. What about the schools with limited government funding? The teaching profession can’t be improved like this. Plus, we can’t measure it, so we’d be foolish to try. Just a couple of the reasons I’ve also got big problems with school-based incentive schemes for students. Pingback: The most valuable resource of all | Code? Boom. As a new teacher PRP does concern me. I’ve had a difficult first year of teaching (year 3) as my Dad dies in the first term and I had to have time off. My class were very disrupted as they had two other teachers cover for me and some were not meeting expectations. Most were EAL and so would not meet national expectations but did very well for they could achieve. If a class like this didn’t meet national averages (and many won’t, otherwise it wouldn’t be an average) then would I not get a pay rise that year? There is enough scrutiny put on teachers and we are observed, assessed regularly. Some research has just been published which suggests the majority of GCSE teachers are strongly against performance related pay. You can find the specific article here: http://educationmarketresearchuk.com/gcse-teachers-are-against-performance-related-pay/ – it’s been released by a company who are supported by the Prince’s Teaching Institute. Pingback: So, what’s wrong with performance-related pay for teachers? « So, what's wrong with school? The management of one of our local schools decided to introduce one of these bullying “unless you’re outstanding you don’t get an increment” policies. After they refused to negotiate both of the larger teaching unions took strike action. After four strike days the governors conceded to all of the union demands but wouldn’t put anything in writing until two days later when after all governors has been consulted. Ofsted inspected the school on those two days and placed it in special measures. (The head and governors had had 48 hours notice.) This provoked a significant number of patents to remove their children from the school. The school now faces Academisation, the governors have been sacked and the SLT cannot feel very secure in their employment. Teacher recruitment here is already a nightmare, special measures will only make it worse. I don’t think there are any winners here. You’re right, John, heads should be very cautious about what they wish for.